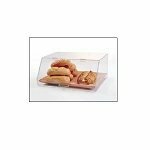 This Acrylic 2 Shelf Bakery Cabinet is the perfect way to advertise candy bars, theater box style candy, bagels and other tasty treats at checkouts, on countertops and more. 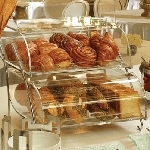 Larger bakery goods fit easily in this enclosed display case as well. Constructed of durable acrylic materials, this see-through enclosed case measures twelve-inches wide by twelve-inches deep and stands tall at approximately 20-inches. This bakery case conveniently offers one door in the rear for making restocking a cinch. Use both shelves to host merchandise of various sorts and you can even cross-merchandise materials. Shoppers will have optimal view of the retail products you display inside. Go ahead and tempt your customers into one last purchase before exiting your business. 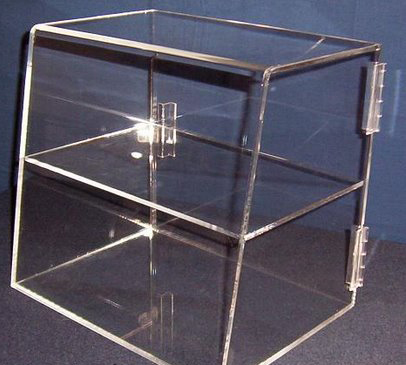 Order your clear cabinet shelving now by just clicking add to cart for an online purchase today!